I cut a small piece of vintage paper to fit in a little metal frame. 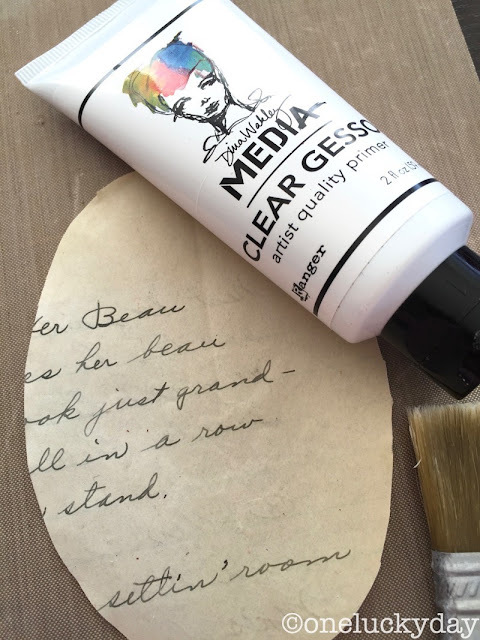 I used a Collage Brush to paint a coat of Dina's MEDIA Clear Gesso over the top of the paper. The gesso seals the paper and gives tooth to it so that other mediums can grab on. I like that the gesso is perfectly clear and fast drying. It did not change the color of my paper either, which I count as a plus! 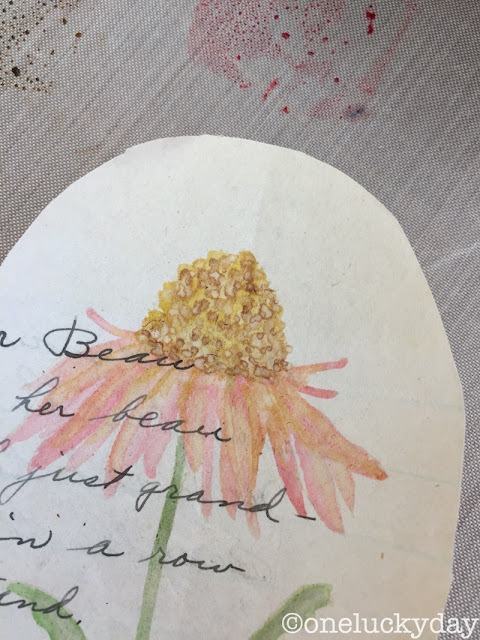 The trick to the realistic watercoloring is stamping the image in a light Distress Ink like Antique Linen (you can barely see it in the photo). NOTE: If your paper is darker then you might need to stamp in a darker color. 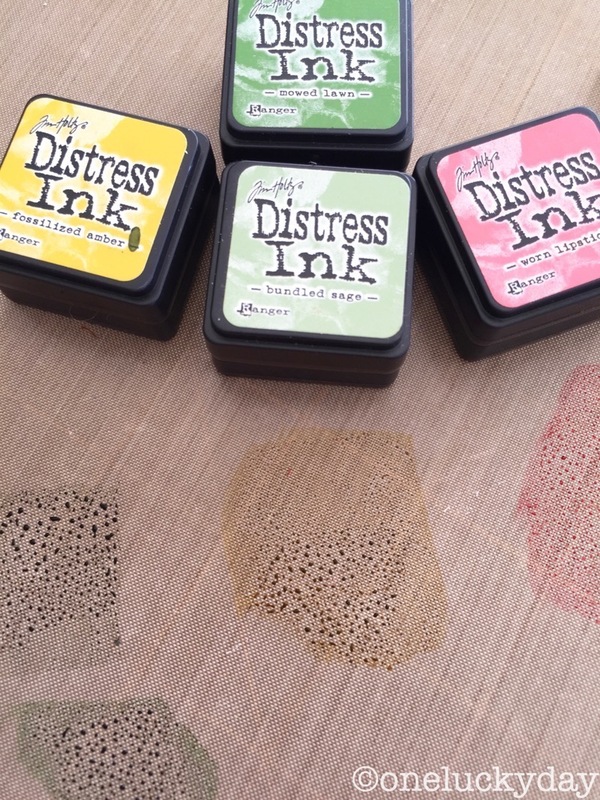 Make yourself a palette of Distress Ink colors on your craft sheet to use for the coloring. Using a Detailer Water Brush, I picked up a small amount of ink color and started to paint the petals and cone. 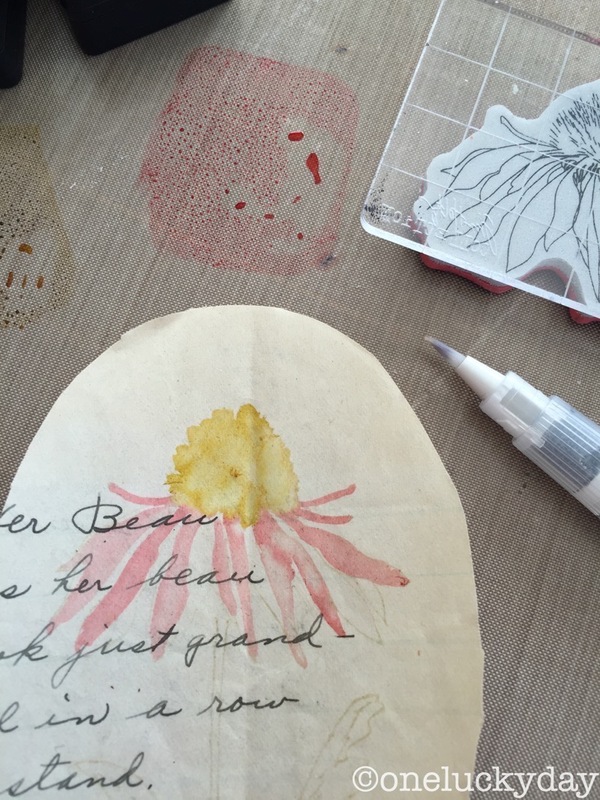 We all know Distress Ink is water reactive so as you paint the stamped image will disappear into the added wash. Thus making it seem as if you know what you are doing. 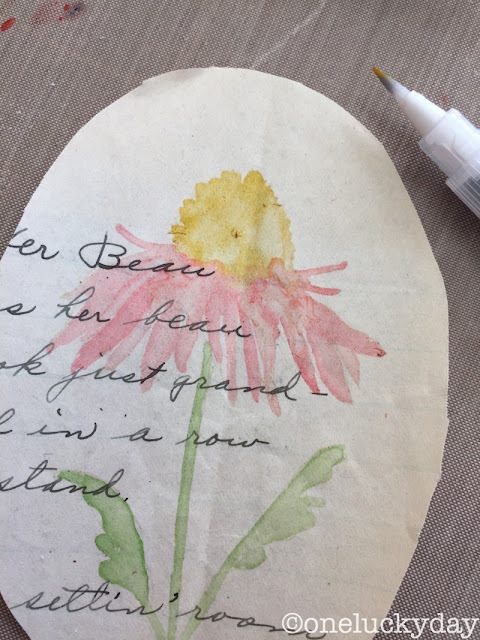 Of course the vintage paper will not react like watercolor paper since it needs to be sealed, but the same basic technique of a light wash and then additional layers can still work. Another tip is to keep the stamp image close by so you can reference it as you paint. Now Mowed Lawn for the leaves. A second layer of petals in Worn Lipstick. Let dry or dry with a heat tool. And the addition of Fossilized Amber to the petals and Bundled Sage to the leaves. Can you see any lines? Nope, me either. I wanted to give the cone more visual texture so I used Gathered Twigs and the very tip of the water brush to add tiny dots. One I was satisfied with my work I made sure it was dry then sprayed it with a matte sealer to keep the colors from fading over time. And into the sweet little metal frame. Media Clear Gesso really made the difference for todays project. Without it the water and ink mix would bleed through the vintage paper and the entire test would have never got off the ground. Instead, I ended up with a sweet little flower in a vintage frame that will be perfect for a grouping in my home. I'm excited about the possibility of working on more vintage paper! Practice, practice, practice...it's the name of the game around here! PS) I'll be back on another day with that original flower I showed on Facebook - just finishing that up now. So beautiful... and presentation along with those vintage buttons even more beautiful ! This is sooooo awesome, Paula! 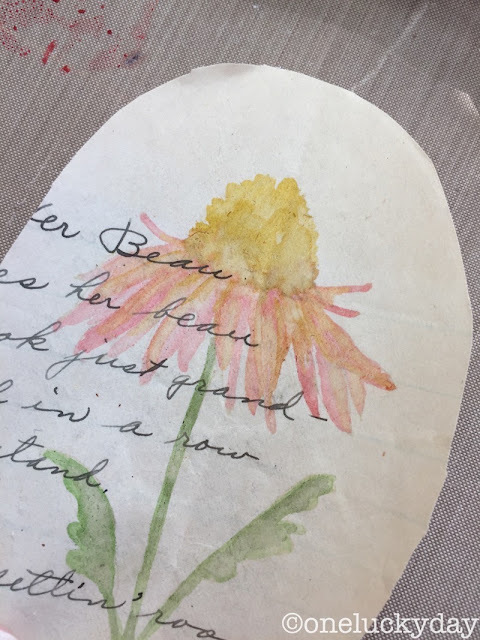 I love that flower set, and love your no-line watercoloring... and then throw in vintage paper and that sweet frame? Akkk...... amazing! Now I want some gesso. Thank you! Fabulous technique. 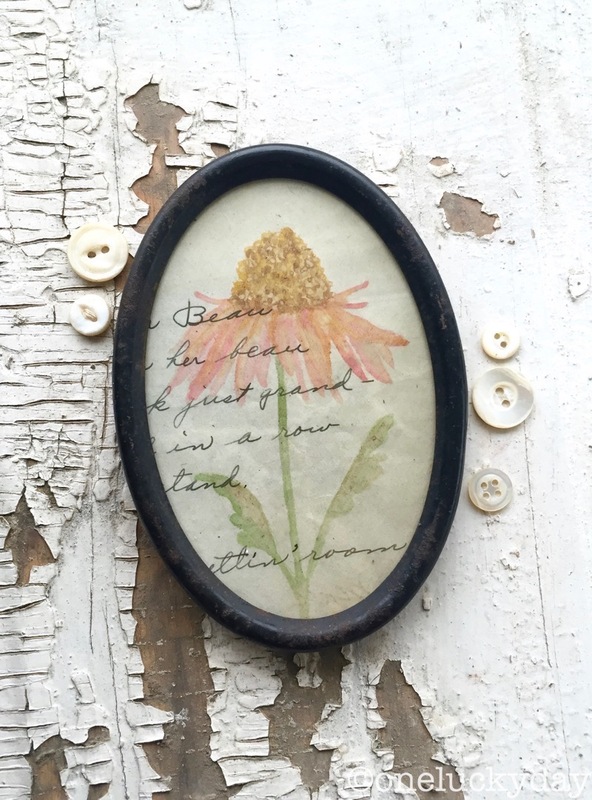 Love this on that vintage paper and I'm off to buy some Clear Gesso!! I LOVE this and I think I have everythi ng except the collage brush so I can try this. Yours turned out beautiful! Thank you for experimenting and giving us your tips. Love clear gesso, one of my all time favourite mixed media mediums! (Have not tried Dona's but I expect it will be similar to others on the market)... Great to see how wonderfully it works on vintage paper. Your projects looks fantastic!! A great experiment with wonderful results! 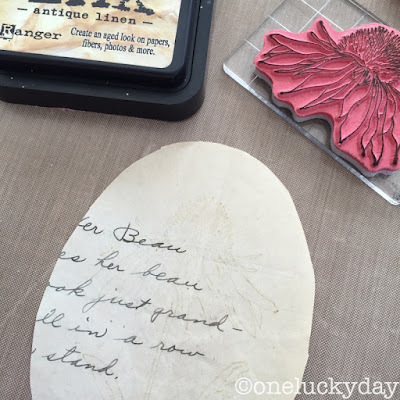 Clear gesso is so useful (a must have IMHO) and your easy-peasy tutorial was a great intro. That coneflower top can be tricky but you nailed it with your delicate dots. 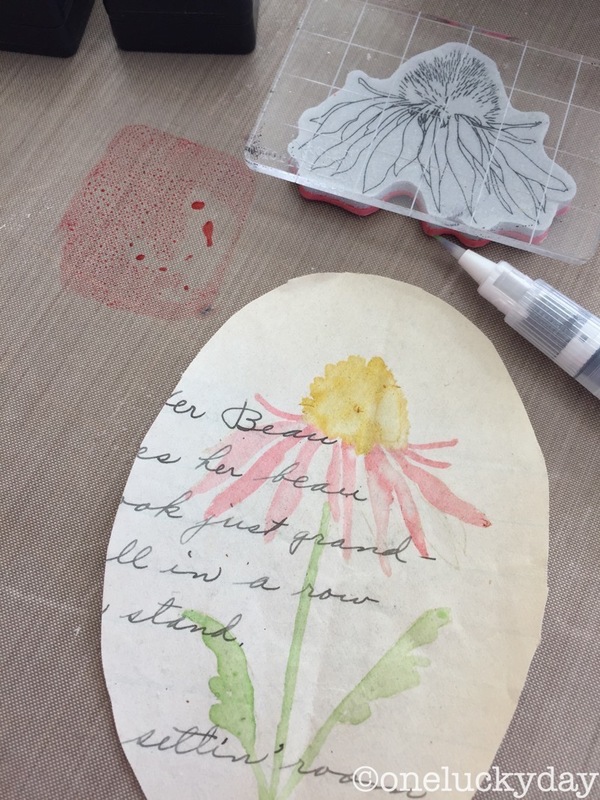 I was thinking you could also re-stamp just the top part of the flower in a darker ink to bring out its unusual texture after you watercolor it's background.